Overlooking Agios Ioannis Bay, Delos and offering sunset views.Facing south, overlooking Agios Lazaros Bay. 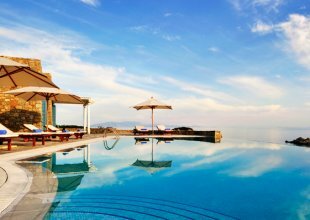 Mykonos Town is 4 km from the villa, the closest shop is 2 km, and the airport is 5 km away. The nearest beaches or Ornos and Agios Ioannis are 2 km from the property. 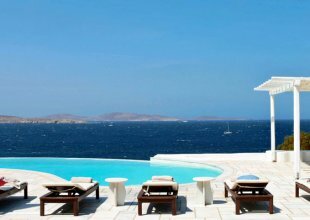 Seaview Delight is a majestic and breathtaking property located in Aleomandra area facing Delos island and its colorful sunsets just above its sister villa Sunset Dream. The property has own security gate with private parking, direct entrance access to top floor bedrooms and a side staircase access down to the main front door. 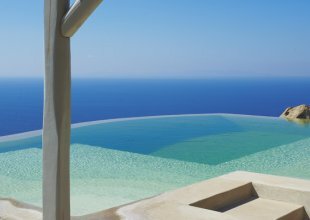 A very spacious white-stone & marble terrace surrounds the house and a gorgeous L-shaped oversize waterfront infinity pool. Elegant teak outdoor furniture under a wooden pergola provides comfort with style. A long outdoor dining table, on one of the side terraces, can accommodate many guests for traditional Greek wood-fire BBQ dinners. The large and bright living room with polished floorboards, features an elegant “art-deco style” of wooden furniture upholstered with cream and white fabrics. The many windows overlooking the pool and the sea confer to this open space a bright and pleasant atmosphere, while the combined open-style kitchen and formal dining area complete the picture. Some bedrooms have direct access to the pool terrace whereas upstairs, island style decorated bedrooms have private sea view terraces. A very pleasant and spacious separate garden apartment with own kitchen and living space has direct pool access.